Human FCGRT&B2M Heterodimer Protein, His&Strep II Tag (SPR & BLI verified) (FCM-H5286) is expressed from human 293 cells (HEK293). It contains AA Ala 24 - Ser 297 (FCGRT) & Ile 21 - Met 119 (B2M) (Accession # NP_001129491.1 (FCGRT) & AAH32589 (B2M)). Human FCGRT&B2M Heterodimer Protein, His&Strep II Tag (SPR & BLI verified), produced by co-expression of FCGRT and B2M, has a calculated MW of 31.2 kDa (FCGRT) and 13.1 kDa (B2M). Subunit FCGRT is fused with a polyhistidine tag at the C-terminus and subunit Beta-2 microglobulin (B2M) is fused with Strep II-tag at the C-terminus. The reducing (R) protein migrates as 33 kDa (FCGRT) and 13 kDa (B2M) respectively due to glycosylation. 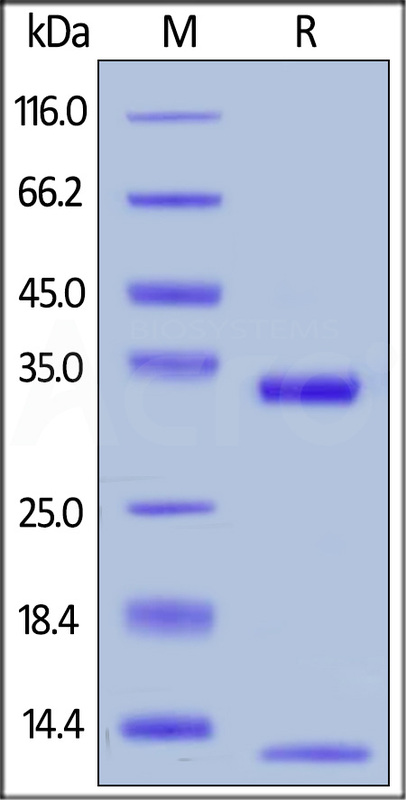 Human FCGRT&B2M Heterodimer Protein, His&Strep II Tag (SPR & BLI verified) on SDS-PAGE under reducing (R) condition. The gel was stained overnight with Coomassie Blue. The purity of the protein is greater than 95%. Immobilized Human FCGRT&B2M Heterodimer Protein, His&Strep II Tag (SPR & BLI verified) (Cat. No. FCM-H5286) on CM5 Chip via Anti-His antibody, can bind Herceptin with an affinity constant of 0.261 μM as determined in a SPR assay (Biacore T200) (QC tested). Immobilized Human FCGRT&B2M Heterodimer Protein, His&Strep II Tag (SPR & BLI verified) (Cat. No. FCM-H5286) on CM5 Chip, can bind Herceptin with an affinity constant of 1.19 μM as determined in a SPR assay (Biacore T200) (Routinely tested). Immobilized Herceptin on CM5 Chip can bind Human FCGRT&B2M Heterodimer Protein, His&Strep II Tag (SPR & BLI verified) (Cat. No. 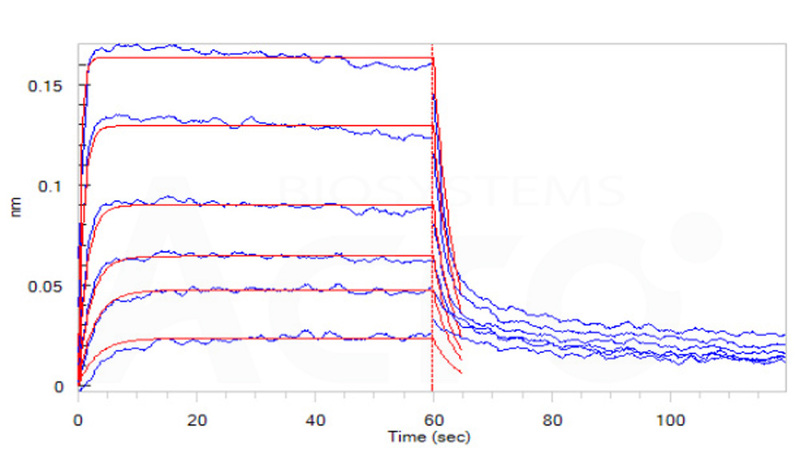 FCM-H5286) with an affinity constant of 0.998 μM as determined in a SPR assay (Biacore 8K) (Routinely tested). Loaded Human FCGRT&B2M Heterodimer Protein, His&Strep II Tag (SPR & BLI verified) (Cat. No. FCM-H5286) on SA Biosensor via Biotin his antibody, can bind Herceptin with an affinity constant of 0.27 μM as determined in BLI assay (ForteBio Octet Red96e) (Routinely tested). Comparative studies of the serum half-life extension of a protein via site-specific conjugation to a species-matched or -mismatched albumin. Authors: Yang B, et al. Authors: Zhao C, et al.